Michael raised his eyebrows and gazed at the ceiling as he racked his brain. “Mincemeat pie,” he finally said. This would be a minced fruit pie, no meat. This would be a scratch pie, no canned filling. Some mincemeat trivia: Traditional British mincemeat was popular from medieval times through the Victorian era, and was made from ground meat, dried fruits, and spices. The concoction was often soaked in alcohol (brandy, whiskey, or rum) for up to 30 days, likely as a preservative. 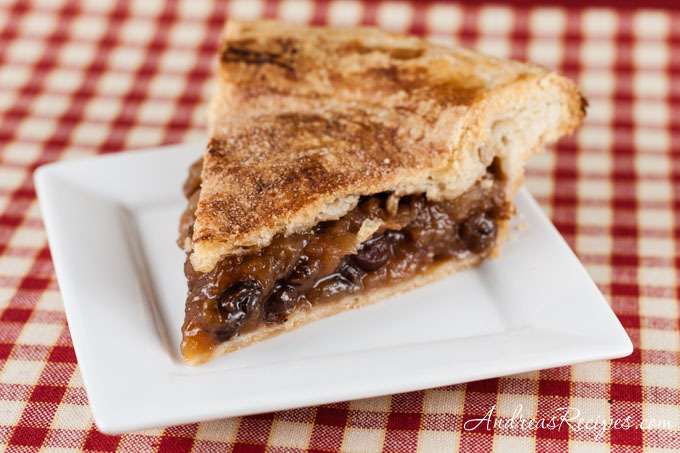 Most modern mincemeat pies really don’t have meat anymore, except for the Amish variety. I read probably thirty mince pie recipes before settling on this one, although in the end we weren’t exactly strict about ingredients. The original recipe calls for candied ginger and currants, but we’re not too fond of candied ginger and Michael couldn’t find currants in any of the grocery stores within a 5 mile radius of our house, so I substituted golden raisins. I made the pie on Christmas Eve and I had to admit that the filling tasted pretty good, and the house smelled wonderful while the pie was baking. Now I was intrigued and looked forward to tasting the pie the next day. Everyone proclaimed the pie to be delicious, even my two picky preschool-age boys—”Mommy, this pie is dewicious!”—and Michael’s mom asked me to post the recipe on the website so that she could make it for our shut-in aunt. So I can admit that I was wrong and post this recipe for a pie that we think is very simple and absolutely delicious. Adapted from a recipe at Whole Foods Market. Combine the apples, raisins, sultanas, and cranberries in a large saucepan. Add the orange zest and juice to the apple mixture. Stir in the salt, brown sugar and 1/2 cup apple juice. Bring the mixture to a boil then reduce heat to simmer for 7 to 10 minutes or until apples are tender. Combine the remaining 2 tablespoons apple cider with the flour. When the apples are tender, stir flour mixture in and cook, stirring constantly until the mixture thickens, about a minute or two. Remove from heat. Bake for 40 to 45 minutes or until crust is golden brown and the filling is bubbly hot. Serve warm or at room temperature. Use apple brandy (Calvados or similar) instead of apple cider for mixing with the flour. Use part Grand Marnier + part orange juice. I r love this pie so good thanks recipe.